Starting in the morning with the formal opening ceremony which featured several speeches the day’s program extended into fun football games for the U10 category which saw 3 schools participate. This was followed in the afternoon by competitions for the U12 competition and later in the afternoon for the youth and women’s open category. Joining in the celebrations were a number of provinces including Guadalcanal who held their event at the Tanagai parish area just west of Honiara. In Malaita, the celebrations were held in Aligegeo field in Auki. In Isabel the event was marked in the capital, Buala. Several other provinces including Makira Ulawa, Western and Rennel Bellona will begin their celebrations on Monday. Bad weather on Saturday forced Makira Ulawa to postpone the program while Western province had to delay theirs due to transport difficulties for their main organiser. However, the main event is in Honiara where governmental and non-governmental organisations have teamed up with SIFF for the National Women’s Football Day for the first time in its history. Their presence is marked with information booths in the academy field where they are making available pamphlets, posters and also quizzes with prizes for the public. Interest in the booths was almost on par with the action on the field. Organisers for the event are saying that the National Women’s Football Day has grown from its humble beginnings into major event for SIFF. 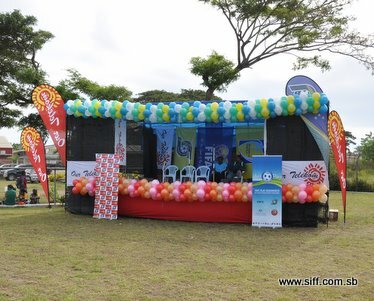 “This year were are able to attract the government ministries and non-governmental organisations to take part in the event and this added extra value in terms of community awareness and education,” Vice-chair person of the SIFF women’s standing committee, Maria Rarawa says. Also attending the celebrations is the Oceania Football Confederation (OFC) women’s development officer, Emmie Sope, who was the guest of honour at the opening and she delivered the keynote address. In her address Ms. Sope highlighted the role football can play in addressing issues that affect women in society. “Women’s football can be a platform for governmental and non-government organisations objectives in gender specific programs,” Ms. Sope says and went on to commend SIFF for organising the event for women footballers in Solomon Islands. Ms. Sope also made a major announcement during her speech revealing to the crowd that FIFA and OFC will be organising a coaching course for women in Solomon Islands this year. This news was welcomed by the mostly women crowd. The main attention for the day was the football games that brought the crowd to the sidelines to cheer and support their teams. The passion and skill was on display but it was also about fun and there was no shortage of laughter when the women’s team took pitch in the afternoon. More activities are continuing today and the program is expected to end tomorrow with the prize giving ceremony for the participating teams.